Ciara Mageean returned to track action as she helped an Ireland quartet finish third in a distance medley race at the New Balance Boston Indoor Games. The Portaferry woman, 22, was joined by other Northern Irish athletes Katie Kirk and Christine McMahon in the team which also included Claire Tarplee. Their time of 11:03.07 was an Irish best for the rarely run event. An American squad took victory in 10:42.57 in a race which had 1200m, 400m, 800m and 1600m legs. Tarplee led off with a 1200m leg of 3:21.06 with McMahon clocking 56.01 for her two laps, Kirk posting an 800m leg of 2:09.06 and Mageean running her mile-distance in 4:36.55. Mageean returned to action late last summer after an injury lay-off of close to two years. 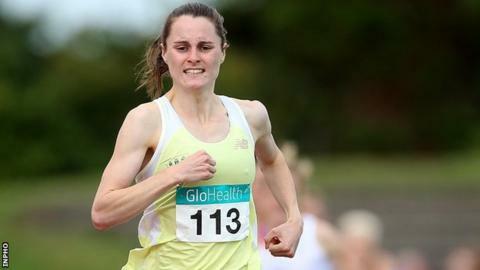 The county Down woman made an immediate impact on her return as she beat Fionnuala Britton to win the Irish 1500m title and then achieved podium finishes in the Great North Mile in Newcastle and Fifth Avenue Mile in New York. At the same Boston meeting, Cork runner Ciaran O'Lionaird limped out of the mile at the 900m mark with the race going on to be won by Nick Willis in a New Zealand record of 3:51.61. However, there was better luck for Declan Murray at another meeting in Boston on Saturday as he produced a European Indoor Championship 800m standard of 1:48.32 when taking victory.